Chuka Umunna called for a government investigation into blacklisting today, following new evidence put forward by Sir Robert McAlpine director Cullum McAlpine. Shadow business secretary Chuka Umunna called for a government investigation into blacklisting today, following new evidence put forward by Sir Robert McAlpine director Cullum McAlpine. 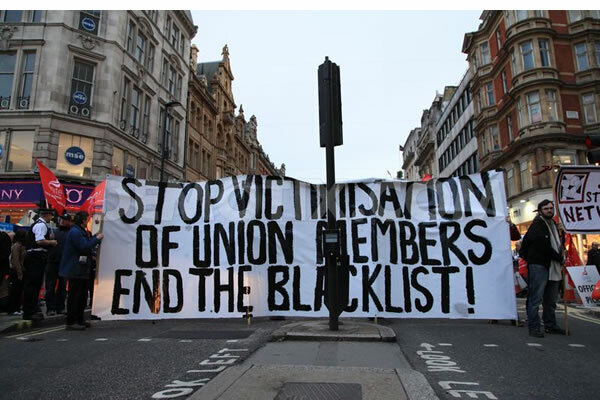 Speaking to the blacklisting debate in parliament, Umunna urged business secretary Vince Cable to launch an investigation into the practice, and whether security firms have been involved in supplying information of trade unionists to employers. He told the House of Commons he had seen the blacklisting files and it was “clear” it “seems improbable” personal information on workers and their activities came solely from the construction firms. However, Cable merely stated he would look at evidence from the Scottish affairs select committee and from trade unions that blacklisting continues to carry on in workplaces today. Blacklisted workers and their families have gone one step further and called for a full public inquiry into how they were disqualified from working in the construction industry, simply for being active trade unionists. Sir Robert McAlpine director Cullum McAlpine yesterday dithered and danced around questions about his personal involvement with the Consulting Association – a company that kept details of workers on secret files which were available to major construction employees. He admitted to being the first chairman of the shady outfit from 1993-96 and his company was the biggest user of the list in the last 12 months of its existence before it was wound up in 2009. McAlpine admitted checks took place on thousands of workers at the Olympics, MOD projects and other major publicly funded projects across the UK for more than a decade. “I was an apprentice in the mid 70s, I worked with a Dundee company on a building site in Perth and we were told when we went on site not to say we were from Dundee because McAlpine’s did not allow Dundee people on their site. McAlpine retorted his company had “never ever operated a blacklist, full stop” and suggested Edinbrugh site managers were merely more comfortable with workers from Edinburgh. “What do you think the Consulting Association was doing then? A dithering McAlpine suggested a blacklist was something that automatically denied people work rather than merely providing companies with information on individuals. “Cullum McAlpine is the ugly face of big business. Completely unapologetic about the lives he has ruined or the torment he caused our wives and children. “Taxpayers’ money has been spent on blacklisting workers who raised legitimate health and safety concerns or who were members of a trade union. This is a human rights scandal bigger than phone-hacking. Corporations should not be above the law: blacklisted workers demand justice. The bumbling boss’s performance has only added fuel to calls for a public inquiry and further suggestions by blacklisted workers secret “encrypted” blacklists are being operated by companies on the net. The Times newspaper also revealed the late Ian Kerr, who worked for the Consulting Association, claimed in his final interview security service representatives attended meetings of the firm. Local trade union organisers, including officials from Ucatt and Amicus, passed the names of some of their own members to senior HR managers at construction companies. The association had close links with the police and security services, exchanging information on environmental activists and construction workers, and at least one senior officer attended a CA meeting. Two companies, Sir Robert McAlpine and Vinci Construction, contributed towards Kerr’s legal and winding-up costs in closing down the association; Kerr claimed McAlpine also agreed to pay a court-ordered fine in exchange for his silence, repeating an allegation he made to MPs in November.